The Domus Publica was the official (Public) Home (Domus) of the Pontifex Maximus (Head Priest) overseeing the Vestals, among other duties (509 BC-12 BC). Excavations have shown originally it was just a cluster of primitive huts (pre or post-715 BC), later a larger rectangular hall structure but still of primitive building materials (interlaced wood branches, reeds, waddle and daub, etc) and later in about 525 BC it was a long rectangular structure with soft tufa stone walls. It was the King's Palace until 509 BC when the Romans overthrew the last King and became a Republic and the Pontifex Maximus was installed there overseeing religious duties of the Vestal cult. The vast majority of the ruins (brick and concrete) you are seeing are post-12 BC when the expanded House of the Vestals built over this House multiple times over the many years. But there is one site of major historical interest here, some scant remains of the Pontifex Maximus' House dated to when Julius Caesar as Pontifex Maximus lived here in the last years and the very last night and day of his life. Search 'google images' for "house of the vestal virgins" for a better and more recent aerial photo. The remains are all brick but one thing stands out which isn't brick and that is a whiteish/gray travertine stylobate which is the # above. A stylobate is usually a stepped platform that columns sit upon ==o==o== . In this case the first step has a groove cut lengthwise in it, this is a rain channel/gutter allowing rain water to run-off. This means it was exposed to the outside elements. The second step is the actual stylobate and in this case it supported a vertical half-column as it has a base cut out of it for a vertical half-column. Like a P vs an ---o---. A half-column is one that is built into a wall, which projects from the wall by about half its diameter. This tells us that an actual half-column once butted against a wall that we know was exposed to the outside. Why? As it was only decorative and not functional? The most logical explanation for that, plus based on the remains' exact location that is in line with the covered structure (which I'll mention next), tells us that it was once one of two half-columns with likely some type of pediment on top that framed an impressive doorway into the Domus Publica. It would look something like this o.quizlet.com/8hiOsvc5WOdWwHOka6hnHQ_m.jpg. This stylobate dates to the dictator Sulla who lived in Julius Caesar's lifetime, Sulla almost had the teenage Julius Caesar killed who skipped the country and Vestals intervened on his behalf. That modern roof covers the Domus' Impluvium, located in the Atrium of the Domus Publica. This was a grand entrance room of any Domus. It was actually an open courtyard with rooms on the side like bedrooms and dining rooms but on the opposite end from the entrance was the Tablinum which was where the head of the house would conduct business or meet with guests. Back to the Impluvium, there was a roof over this Atrium/courtyard that sloped downward with a rectangular opening in the center. This allowed rainwater to fall into the impluvium, so in effect a small sunken pond in the atrium's center. Below that was a cistern which stored this rain water but now with the aqueducts it was no longer needed and became more of a decorative feature in the atrium and could now even have a fountain filling it. And beyond the Atrium was a room with a mosaic floor named the Tablinum. In a rich person's domus the father (head of the household) would store family records, have family statues/portraits or anything he wished to show-off to his guests. The effect was if you were socially beneath this person or wanted something, you enter the door, short corridor into beautiful large Atrium and at the opposite end you see the Master of the house awaiting you in the Tablinum. A view through the Atrium into the Tablinum would look something like this photo. In our case the Tablinum's back wall would be a semicircular apse. In the photo look for a partial section of a wall (vertical || in the photo) that marks the eastern limit of the Domus. In the photo it's to the right and past the intact roundish Temple of Romulus on the opposite side of the Via Sacra. The back of the Tablinum would have been at this wall. Finally imagine rooms above and below that long narrow section in the photo (actually walking through it the rooms would be to the left and right). That is the known section of the Domus Publica with very likely some basement rooms (just across the street there you can see basement slave cells from a private Domus/house of the same era). And there was probably at least a second floor over this. 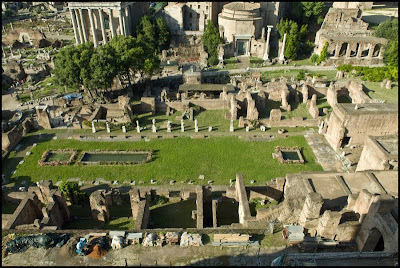 Now when Augustus gave the Vestals the Domus Publica (12 BC) they expanded their House all the way over to the right (the grassy area with the ponds in photo). So it's possible the right half of that section belonged to the Domus Publica or the Vestals perhaps just an open space like a garden? Anyway something was there and after the 12 BC fire the Vestals had that section along with the Domus Publica and expanded. Now then, when you actually get your 'boots on the ground' things look quite different. Hop the fences to get a good look at things, as in this photo. www.photoroma.com/foto.php?City=rm&ID1=1127&ID2=0, or this photo, from 2014, or this photo, also from 2014, shows the real view of the stylobate, with the Atrium behind it. To the left of that half-column in the stylobate was the main entrance used by Julius Caesar and others to enter his home. The remaining section would be the lower right side only but with a circular half-column base and larger wall blocks. Note that this half-column base is part of a wall block and there is also a wall block next to it. So to the left of that half-column base would be the doorway into the Domus which is in line with the atrium as it should be. Then through this entrance and into the Atrium where under the modern roof you can see the atrium's impluvium and then past that (bring a shovel) you can dig up the Tablinum where Julius Caesar entertained guests and those on official business. But perhaps it would be better to just visualize this behind the fence and avoid the legal bills and jail time :-) . As you walk toward the east on the Via Sacra you can compare the view against these photos which were taken from that road. Then when you reach the far eastern end you can get a view of the Tablinum and the Atrium behind it, as in this photo. So just remember when there to stand across the street from the #27: Temple of Antoninus and Faustina, with your back to that temple, then turn 45° to the left toward that group of trees. Walk around until you can find the travertine half-column stylobate beyond the fence. When you can best line up that stylobate # with the modern roofed structure [x=x] behind it #[x=x] and stop there. You're now looking through the front door of Caesar's home. Think of the others who have also walked through that door to visit Julius Caesar... Marc Antony, Brutus and a young boy visiting his great-uncle who will one day inherit his Empire as Julius Caesar's adopted son and heir. In my opinion the archaeological evidence is overwhelming and rock solid for this as the main entrance door location into the Domus Publica. So an impressive wall and with the front door # into a short corridor -- with a service room on each side, into the beautiful Atrium [x=x] under the modern roof, with the Impluvium = in the center, and then the fancy impressive [T]ablinum #--[x=x][T] . With bedrooms, a dining room, etc off both long sides of the Atrium and likely a second story at the least. This Stylobate dates to the time of the Julius Caesar as does the rest of this excavated House of the Pontifex Maximus. It's the evening before the 'Ides of March' Julius Caesar and Marcus Aemilius Lepidus (Caesar's General mentioned at the Regia) have just finished dinner along with others and *Decimus Brutus* (a different Brutus but a major player in these events). Julius Caesar is catching up on some work (reading and signing things) while everyone else is engaged in after-dinner conversation. The topic of "What is the best death?" comes up and Julius Caesar quickly answers "A sudden one". He will get his wish tomorrow. That night Julius Caesar and his wife go to sleep but it will not be restful! In the middle of the night the doors and windows in their bedroom in blown open by a violent wind. Julius Caesar has a dream that he is flying above the clouds holding the hand of the God Jupiter. His wife has a nightmare, she dreams that the pinnacle (placed there by the Senate) atop their house falls and smashes on the ground and she weeps over the body of her murdered husband in her arms. The morning of March 15, 44 BC, the 'Ides Of March', Julius Caesar woke up ill and his wife tells him of her dream and she begs him not to go to the Senate meeting that day. Julius Caesar is worried by her pleas as she is not an overly superstitious person. Later the Priests report to him here that they have made several (animal) sacrifices and found them to be inauspicious (unfavorable), so already with ill health, bad omens (storm), his and Calpurnia's dreams and now unfavorable sacrifices! Julius Caesar hesitates for quite a while and finally decides to send Marc Antony to the Curia Pompey (about 1.4 km away) to dismiss the Senate. But one man speaks up who is there at the House 'Decimus Junius Brutus Albinus' aka *Decimus Brutus* or Brutus Albinus, again not the famous Brutus but he is his distant relative of his. He is a confidant, trusted military ally and a close friend of Julius Caesar, and is actually in Julius Caesar's will as a second heir (more as an overseer of his decrees and not an actual money/property inheritor). He is also a major player as one of about sixty assassination conspirators. His life and the others, all depend on Julius Caesar going to that Senate meeting. If not, it's probably for certain that by sunset Julius Caesar will have gotten wind of their plot. The "cat is out of the bag" and the rumors have already started and they will not get a second chance. *Decimus Brutus* tells Julius Caesar that *HE* called this Senate meeting and it would be insulting to the Senators not to show. He scoffs and mocks the Priests and their Sacrifices. And he then tells Julius Caesar: "Caesar shall we tell the Senate you will only meet them when your wife has better dreams? ", "What will your enemies say?" "The Senate wants to give you the title of Rex (King to be used *only* outside of Italy and only to fulfill a Sybil prophesy, Julius Caesar is 'Dictator For Life' [Dictator Perpetuus] but the title *King* to the Romans is like the title *Dictator* to us) and will vote unanimously for you". Decimus Brutus takes Julius Caesar's hand and leads him towards the door. "At least, if you think this day is unfortunate, the decent thing to do is to go to the Senate meeting yourself and adjourn it in person". Julius Caesar agrees and walks out the door. Its late-morning March 15, 44 BC as Julius Caesar walks out this door for the last time in his life. In hindsight we know that a few hours later three slaves sent by his wife will return with his body on a litter and re-enter here. He leaves for the Senate meeting with only a small entourage, including friends and conspirators but no bodyguards. (He had already disbanded his Spanish bodyguards, his friends urged him to bring them back into service but Julius Caesar refused.) Even if Julius Caesar had heard rumors or thought of a possible conspiracy this would be typical of him. In battle when the tides were turning against him, he would send away his horse and his bodyguards and fight alongside his men. His bravery would rally his troops on to victory. Once the enemy's reinforcements arrived and he was now vastly outnumbered and surrounded. Any other commander probably would have dug-in or attempted a break-out. Instead Julius Caesar split his troops and attacked both fronts and Won. Some make the claim this was just Julius Caesar's way of committing suicide due to illness and failing health and die a hero. I doubt it though. The Via Sacra is *mobbed* with people outside his home that morning, most are just onlookers, others to try and give him a petition for something they want or desire. But two people in the crowd have an urgent message for Julius Caesar, but only one will get through. A servant sent by his master or mistress tries to get to Julius Caesar as he leaves his house but cannot get through the mob that surrounds him. He goes to Julius Caesar's house and begs Calpurnia to secure him until Julius Caesar returns because he has something of great importance to tell him. And the other is a teacher of Greek logic named Artemidorus who knows the famous Brutus and his friends, but also knows their secret. He is in the crowd that day with a written message warning Julius Caesar of the assassination conspiracy. He notices that Julius Caesar is handing all the petitions he receives to a servant to read later. Artemidorus pushes through the crowd, hands Julius Caesar his message, and tells him "Read this Caesar, alone, and quickly, for it contains a matter great importance which concerns You!!!". Julius Caesar tries to read it several times but he keeps getting distracted by people wishing to speak to him along the way. It will still be in his hand and unread when he enters the Senate building. Julius Caesar is 56 years old when he leaves his house and has less than an hour remaining in his life. In about three or four hours he will be returning home along this same route in a litter carried by three slaves sent by Calpurnia to retrieve his body and bring it home. One bloodied hand hangs from the litter as it crosses the Forum, in the other hand he still clutches that unread warning note! Suetonius records that the Physician Antistius performed Caesar's autopsy here and that note was still in his hand! (By the way, this is history's first recorded autopsy). His body was later waked in this Domus, likely in the Tablinum. Three days later, on March 18th, his body is carried through that door on an elaborate funeral bier (a richly decorated open coffin) and over to the Rostra of Caesar where Marc Antony has a few words to say, and the rest is history. Over 100 years ago two books were published about the Roman Forum excavations and this site in late 1800's: books.google.com/books?pg=PA65&lpg=PA65&dq=%22domus+publica%22+impluvium&sig=0h7RaCctzLmzwedTDs_U9vVwrG4&ei=SHloUJ7XHuTbigLWioGQDQ&id=z98tAAAAYAAJ&ie=ISO-8859-1&ots=bHZxzaBpen&output=html_text and www.archive.org/stream/recentdiscoveri00baddgoog/recentdiscoveri00baddgoog_djvu.txt. If those links go dead try Google for the complete text of these books now long out of Copyright. They tell of the travertine half-columns and the rain water channel of the Domus' wall facade. And beyond that the atrium with a deep Impluvium. And beyond that the Tablinum with a mosaic floor and an apse in the back. And on the right a room with a delicate mosaic floor and a beautiful fresco wall. And of the earliest foundations to its last rebuilding (first Century BC). First: Walls built of large blocks, 2 Roman feet thick of soft Tufa the earliest building material used in Rome this probably belongs to the Regal (Kings) Period. These were rapidly crumbling away during the nineteenth Century excavations. Second: Blocks of hard Tufa 18 - 22 inches thick and 3'6" - 4 feet long perhaps from the rebuilding of 390 BC or 210 BC. Third: Concrete walls faced with bricks, columns of Travertine (loose or in place) and fine mosaic pavings, this is first Century BC. Also now lost due to of exposure since the 1880's was the painted stucco inside and outside the house. All the materials were once covered (tufa, travertine, brick facings), columns were crimson, rain-water channels were blue, inner walls with simple leaf ornaments, wreaths and flowers in panels with circles or garlands in the center. And iron nails were also found in the brick facing to anchor the stucco. Please see the related 'Ides Of March' Julius Caesar's Assassination Walking Tour.